Uptown Update: Latest On Wilson L Progress -- The End Is In Sight! Latest On Wilson L Progress -- The End Is In Sight! 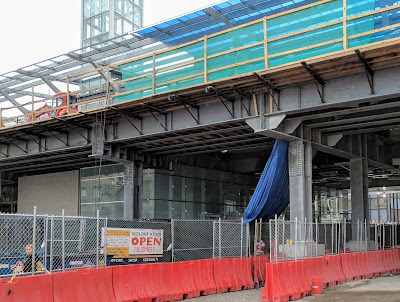 There are many signs of progress/activity at the Wilson L station this week, and many readers have noticed and commented. We reached out to the CTA rep to find out what is happening during these final few months of station and track work. Reminder: CTA's goal is to have the tracks, platforms, and station operational by the end of September, and the renovated Gerber Building done by the end of January. "This is my favorite, albeit most hectic, part of a construction project because things start to take shape. Wilson Avenue will be closed to vehicles until 7/20. During this time, we will be completing the Auxiliary station drainage connections, painting the track steel over Wilson and installing new sidewalks on the north side of Wilson (in front of the new Auxiliary station). The auxiliary station is furthest along and is tentatively scheduled to open up in a temporary condition in early August - more information to come. Doing so will allow us to close down the current temporary entrance on the South side of Wilson in order to complete work on the main station in time for the September opening. We also have Broadway street closures at night this week between Wilson and Leland, Monday-Friday, 8pm-4am, in order to finish erecting and painting the steel over Broadway. Street will be closed to vehicles. Sidewalks will remain open with intermittent closures. Sunnyside entrance & ramps are taking shape. We have been working Saturdays consistently, I would expect this to continue. After this week, there shouldn't be any more nights for a while – which I’m sure everyone will be glad to hear. The air horns that you hear are a protection mechanism utilized by CTA personnel to alert our workers of incoming trains so that we can safely get out of the way. They are especially important at night time when visibility is reduced. I know they are annoying but we shouldn't have many more nights coming up." So exciting to see everything take shape after 20 years of promises, and three years of work. So much has been done, with relatively little left to do.